The Madras high court today (Apr 08,2019) has totally scrapped the Chennai-Salem 8-lane project by canceling all the Government orders related to the project. The court has also rubbished the already acquired lands, which means the acquisition is now invalid and the lands are to be returned to the people. The 8-lane highway between Chennai-Salem is a 10,000 crore project that was inaugurated in 2018 by the ADMK Government. It was met with huge outburst from the people as well as the opposition, where people deserted their houses and agriculture lands, as their properties fell under the acquired project plan area. There were public protests by blocking the roads demanding to drop the project in many places. Cases were registered left, right and center including cases from many social activists, Anbumani Ramadoss and Environmental group Poovulagin Nanbargal. The ADMK Government hasn't given up even when all hell broke loose. With huge expectations on the verdict, the two-judge bench said that the project did not have proper planning before the execution. Starting from acquisition of lands to the ecological safety, the judges lashed out everything related to the project. Since the 10,000 crore project has some parts running through the forest area, the court has also taken assurance from the central government that it shouldn't continue the project without the approval of Environmental ministry. Although the verdict is against the project, this may actually not be the end of the 8-lane project as the state is expected to take the case to SC; so more drama awaits. ‘மச்சான்.. என் மேரேஜ் இன்விட்டேஷன தூக்கி போட்ரு ப்ளீஸ்’.. அசரவைக்கும் காரணம்? This page contains news relating to various facts and events. The views are generally about current affiars and general topics in diversified areas such as political, international, national, and regional issues, sports, health, travel, lifestyle, technology and business. People having similar interets on the above topics will find this page useful. 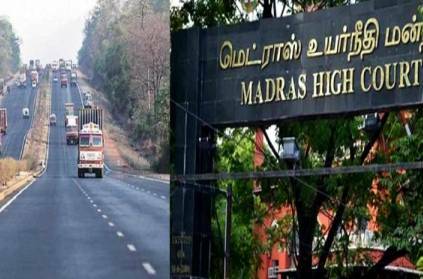 8-lane highway got cancelled by high court | Tamil Nadu News.